Nordic skiing, by general definition, refers to the sport and recreation of skiing on skis that have free-heel bindings. This includes the Olympic winter sports of cross-country skiing (also known as x-country or XC skiing), ski jumping, and Nordic combined, as well as two back-country skiing styles called Telemark skiing and ski touring. CANSI is currently focused only on the development and certification of teachers (instructors and coaches) of cross-country and Telemark skiers -- be they recreational or Olympic level. Cross-country skiing evolved as a way of moving from place to place in winter over a country side into a very demanding Olympic sport that now is separated into two main styles of skiing: classic and skating (also known as freestyle). Classic style of skiing refers to cross-country skiing where the power to move forward comes mainly from pushing down on one ski and griping it to the snow, and then transferring body forward and over the other, gliding ski - in quick, alternating motions. Skating style of skiing refers to cross-country skiing where the power to move forward comes mainly from pushing sideways on an edge of one ski and then another ski, while both skis are continuously gliding. This style of skiing is similar to ice (hockey/speed) skating. Telemark skiing refers to downhill skiing style using the Telemark turn, which is a technique first developed by Sondre Norheim. Telemark turns are led with the heel flat on the outside ski, while the inside ski is pulled beneath the skier's body with a flexed knee and raised heel. The skis are staggered but parallel, and 50-80% of the body weight is distributed on the outer ski depending on snow conditions and terrain. Telemark skiing can be done with cross-country equipment, but specialized telemark boots, bindings, and skiis allow for higher performance skiing in more difficult conditions. Modern Telemark equipment looks similar to alpine ski equipment except that the boots allow the foot to flex in the forefoot, and the bindings allow the heel to rise off the ski. Telemark skiing is done both in the back-country, and in alpine ski resorts. 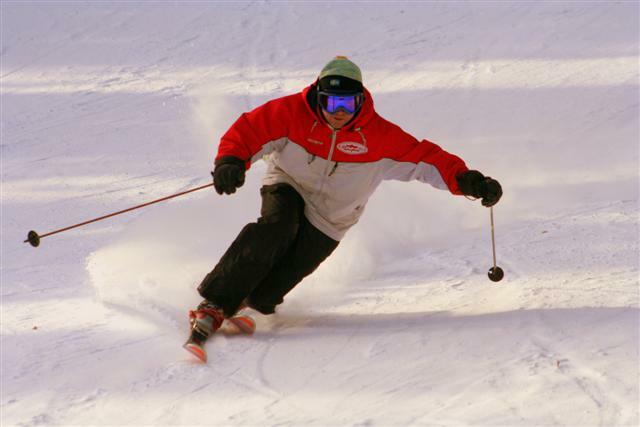 CANSI Telemark instructor certification courses are normally taught at alpine ski resorts, and require the use of modern Telemark equipment.